New York City is one of my favorite places, so when I was informed by Henry Erlich that this conference was being held in the Big Apple, there was no hesitation in buying a plane ticket. The conference was this past weekend, May 13th-14th. I was only able to attend the primary day. However there was plenty of information to be absorbed. My main reason for going was to hear the prestigious and awe-inspiring Dr. Xiu-Min Li spill her knowledge on allergic disease, ASHMI, and her take on Red Skin Syndrome. She will be one of the doctors I humbly get to interview for the documentary this summer, and I am stoked! Such an amazing woman whose research I know will change the way we treat eczema in the next decade. I see a Nobel Prize in her future. Dr. Li has a phenomenal opportunity while working at Mount Sinai, bringing together both Western and Eastern medicine in a clinical setting. No Western doctor will be able to deny her results and her rigorous efforts to show how wonderful Traditional Chinese Medicine can be (and is!) for our growing allergy and eczema problems. Besides Dr. Li, there were a plethora of doctors participating, some even flying all the way from China. We had headphones and a translator present in order to understand everyone speaking. At the bottom, I will be posting a video of Dr. Li’s talk and all that I was able to film. Sadly, I was told we couldn’t video anything so I wasn’t prepared. It was only very late the night before that I was told I was misinformed. I did my best filming with my heavy camera and old phone while trying to listen. It’s a bit shaky, so I apologize. It had been down pouring that day, which soaked my shoes, so most of the conference I was bare foot, attempting to sit on my feet in hopes of warming them up in that already frigid auditorium room. Her son, Eden, had horrific allergies, asthma, and skin problems. She found Western medicine was not helping their son improve. She is an avid promoter of Dr. Li’s work and is happy to say her son is finally able to enjoy life because of her protocol. She is the author of Feeding Eden, a memoir about raising Eden with all of his serious health problems. I think the most profound thing she mentioned was her question to Western medicine doctors: “How do we treat the entity of allergic disease?” Medicine seems to be extremely narrow-minded instead of looking at the body (or a condition) as a whole. She gave a brief oration before her longer one at the end of the conference. The merit of her work is astounding and she emphasized how necessary it was to be able to show how TCM brings results that Western doctors can believe in and not have them be able to dispute them as “false” or “not supported.” All of her work has to be proven through science. *Apologies since I skip over a few speakers* I loved how she spoke about how the integrative world is striving to be more innovative and adaptive to Western world medicine in hopes of showing how TCM is helpful and important in giving patients relief. Basically, there are FDA guidelines/guidance for using botanicals (herbs) in medicine. They are tested in clinical trials just the same as Western medicine, so they are treated equally. It can not be written off. A demonstration of quality control was given, and how they wish to minimize any chemical, biological and pharmacological variations to obtain consistent drug substances. He gave a speech about how using TCM is about keeping harmony in health with our whole body working together as a unit. We are individual people with individual needs, something Western medicine does not always provide. We should be more patient-centered with medicine. He also advocated health in daily life, reiterating how prevention is key. He spoke eloquently about his field in allergy/immunology in babies and what could be causing such an exponential climb in allergies these past few decades. No one is for certain, but he feels having exposure to the skin could be a factor. For some reason, there has been found to be peanut dust inside of homes, which is where skin contact could become an issue. If babies have eczema, they are at a higher risk for allergies. He would use oral immunotherapy to try and desensitize the allergy, hoping to eradicate or raise the threshold. Scott touched upon using biologics (omalizumab) for some cases for 20-22 weeks (it’s an anti-IgE), but he says it doesn’t mean it’s going to be any more effective (just perhaps speeds the process). Rachel continued to speak on allergies and issues in infants and children, focusing a bit on pregnant woman. She showcased how if a pregnant woman is under stress, her child is more likely to have wheezing. She also explained how methylation and DNA does play a role in some of these areas and how Dr. Xui-Min Li’s protocol, ASHMI, has shown good results in pregnant mothers. She gave a very in-depth speech about allergies and infant treatment. When she mentioned starting oral tolerance as early as 1 year old, a question popped into my mind. If we can detect and start to treat allergies at that age, why is it that Western doctors are so quick to lather steroids on a baby, but claim they can not test for allergies until about 3 years old? That’s something that I feel should be addressed. When it comes to peanut allergies, she said she personally thinks using boiled peanuts instead of baked are safer to use for desensitization without losing efficacy. ** Funny side note** Dr. Xiu-Min Li came up and asked a question during Q&A. She asked it in Chinese, and the speaker answered back in Chinese. Everyone asked what was said so Dr. Li offered to translate. She started to do the translation, but didn’t realize she was still speaking in Chinese, so someone stopped her. She didn’t realize she wasn’t speaking English. We all had a laugh. One of his best and to the point notes was that IgE is central to the pathology of allergic disease. Another subject he touched on was FAHF-2, which is another herbal formula much like Dr. Li’s ASHMI. Berberine, an herb, is the most potent at reducing IgE levels, and can even help lower glucose. However, it is very badly absorbed taken orally, so they are trying to make it more effective (perhaps, adding to a molecule). She studies Mast Cell Activation Disorders. Anne used the Great Wall of China as an analogy, how it’s not always effective for keeping the bad out. Mast cells can release different things, like histamine or tryptase, and just like a police call, you want to send the correct team out to help for the correct situation. She also touches on how when we figured out how to decrease certain bacterial-based diseases (like Measles), hypersensitivity disorders increased (like allergies). Naps, apparently, are something we need more of to help with stress (which I totally agree!). She spoke about our skin barrier and how we shouldn’t use alkaline soap on baby skin. The best thing she mentioned however was that at the latest AAD meeting, she saw a slide that said steroids do, in fact, have the ability to cause allergic reactions in patients. Near the end, she spoke about Vit D and how it’s definitely important for our bodies. The last two speakers were Tiffany Camp Watson, the mother who gave her testament about using Dr. Li’s protocol, and then Dr. Xiu-Min Li herself! They are both on the YouTube video speaking. Most of the video is of Dr. Li speaking. After 6:30 mins, it is all Dr. Li and her presentation. I hope this was informative and I can’t wait to have all my equipment in to shoot these upcoming interviews! 2.5 weeks to go! What type did you use: She started on over the counter low doses in 2014 sparingly (Dermaid, Hydrocortisone Acetate 1%, mild potency), before being put onto moderate potency betnovate 1/5, cortival 0.02%. It would clear for a few days and she’d be pale white, before her skin would erupt in eczema worse than it was previously and she’d be put onto antibiotic cream (bactroban ointment) and a round of internal antibiotics (usually cefalexin) to settle what had turned into a skin infection. This cycle continued for a few months, while she became more allergic to foods and environmental factors. We finally got her in to see a reputable dermatologist and she was then put on further antibiotics, potent steroids- Eleuphrat (x2 daily for 4 days with 3 days break, the rebound flares in this 3 day break were horrid for her), Tacrolimus 3% (immunosuppressant protopic – we were told by the derm that this was better for her face because it didn’t have steroids in it, after which I questioned why I couldn’t just use it all over her body instead and his answer was “because it’s too expensive”, it was $50 for a 30g tub, it didn’t last long, we had no idea it was an immunosuppressant! ), the next appointment her dosage was upped again, and we were told to keep up with the creams 3x a day for 7 days OR UNTIL IT CLEARED (this was after explaining how horrid the flares were when we stopped for her 3 day break as prescribed in the previous appointments). She was already showing all the symptoms and signs of RSS, we had NEVER heard of it before, but knew she was getting more and more unwell, this was Dec 2015 and she could no longer eat anything (even her safe food of chicken and rice would cause a facial flare that was similar to that of the beginnings of an anaphylactic reaction) During this time, she had been given oral steroids 3 times in emergency (the latest being january 2016 after she ate half an orange and had painful hives for 48 hours straight). By February 2016, she was no longer well enough to attend daycare, she was constantly covered in blood and sores, unable to sleep, needed her ventolin puffer twice daily, her IgE levels were 10 thousand times above the normal range and we decided with our GP to trial 6 months removal of steroids as all other triggers had been eliminated. When we contacted our derm and told him our decision, he ceased all contact with us. By month 8, she was showing signs of healing and was finally seen by the specialists at the Children’s hospital, they applied for IVIG therapy for her (Intravenous Immunoglobulin) and this started in month 9 TSW, she has the infusion monthly via cannulation, and she absolutely hates the needle but when I ask her now what makes her feel better – she says her medicines from her needle. She has improved ten fold in the last 4 months, and although the hospital hasn’t agreed to her being in TSW (she is considered as severe eczema) it has been a godsend in helping her move forward, she was even able to start school this year! There was no way she was able to leave the house for more than 45 minutes a few months ago with out having a complete crippling itch attack, so it’s comforting that her immune system is on the mend. What is the hardest thing to deal with during this condition? Not being able to play, to run, to jump, to go to school, to dance, to do sport, not being able to be normal like before steroids. 1. When did you start using topical steroids and why? Torrin started at about 4 months for eczema. Small patches first seen on his upper lip and back. 2. What was the name of the topical steroids? He was first prescribed hydrocortisone. 3. Were you ever prescribed more potent steroids? Hydrocortisone, Betamethasone Diapropionate .05%, Desonide .05%,Fluticasone Propionate .05% (external cream),Fluticasone Propionate 50mcg (nasal), Qvar 80mcg,Triamcinolone Acteonide .1%,Qvar 40mcg,Elidel 1%, Fluocinonide .05%, Fluticason Propionate .0005%, Mometasone Furoate .1% (cream), Mometasone Furorate .1% (ex ointment), Mometasone Furoate .1% (ex oint), Protopic .03%,Pulmicort 1mg (inhale), Qvar 40mcg. 4. How did you find out about RSS? On September 11, 2014 I was researching hemp oil (anything to “cure” him) on Amazon. I was told to check out a few sites in that review and ITSAN.ORG was one of them. As soon as I read the signs and symptoms, I knew without a doubt Torrin had RSS. 5. What made you feel you had RSS? He was full body red, extreme itchy, dry/flaky skin, water burned and stung him. 6. Were you diagnosed by a doctor? Did you have a supportive doctor? Yes, his pediatrician listened and read the ITSAN material. Then to just educate her on RSS and/or if we needed any medicines, we confirmed the RSS diagnosis with Dr. Rapaport via telemedicine. 7. What were your first symptoms? Before we knew it was RSS, Torrin already showed signs of TSW ( “bad dandruff”, dry/flaky eyes and skin, redness, sensitivity to heat and water. When we stopped all steroids on 9/12/14 within a few days he became really red, itchy all over. His legs were swollen and could barely walk. The horrible “pins and needles”. 8. Is your family supportive? Friends? Yes, our family was supportive. Friends were supportive but many just dwindled away and stopped asking to do things (because we couldn’t). We had no life for 2.5 years, basically. 9. Have you ever been to a hospital for this? Why? Yes,about 28 months in I took him into Urgent Care because his arm looked like eczema herpeticum. Thankfully it was not. 10. What was the hardest part of this condition? Everything! Watching your child itch himself till he was bleeding, the pain that followed, “pins and needles”, water like acid on his skin, watching his friends go to school, play sports, vacations, swim etc. We went from a very outgoing, athletic family to holed up inside their prison home for months and years. 11. How long have you been in withdrawal? Since September 12, 2014, 29 months. Torrin is still in withdrawal and has flares on his wrists, knees and feet but nothing like on or after steroids. He was able to bathe and swim after 1.5 years into withdrawal. 12. What do you use as comfort measures through this? At first baths and Aquaphor for 6 months into TSW. After that he chose moisturizer withdrawal so no bathes and very little Lemongrass Balm from Stephanie Home Apothecary and Honeypacificaco.com. Also, ice packs and fans. 13. Are you employed? Has this affected your job status? I have always stayed home with my boys. I only worked part time but had to give that up to take care of him 24/7. Our family, unlike many others, were financially stable. 14. Has this affected Torrin’s education? Yes! He missed all of 4th grade because he was bed ridden. I homeschooled him online last year and some of this year. He went back to school on 2/1/17. He was also held back a grade. 15. Have you gone to therapy/wish to go to therapy because of this condition? No, we have not gone. Torrin seems to be doing fine and adjusting at the moment. Me, I’d like to go since I have been experiencing depression, anxiety and PTSD. 16. If there is one thing you could say to another sufferer, what would it be? Sometimes just allow yourself to just lay there and breathe if that’s all you can do at the moment. Sometimes that’s all I could do as I laid on my bathroom floor at 2am crying because I watched him go through so much pain. FAITH in God, HOPE that he will heal and the LOVE for my child is what got me through each day. Thank you so very much for sharing your story, Torrin! I wanted to make another blog just showcasing some of the things that are being posted in the groups. This PREVENTABLE condition is causing so much pain and suffering. All I wish to do is play a role in ending the overprescription of topical steroids so this pain can end. Please consider donating to this cause either through the project PayPal (preventable.doc@gmail.com), or through the donation link on the front page. Way too many of us get laughed at in a doctor’s office. How inconsiderate, especially if we are bringing FACTUAL resources with us written by other doctors. This is so much more than a skin problem. Our mental health comes into play and we need all the support we can get. Doctors are prescribing these drugs to be used on places the very drug itself says NOT to be used on. There needs to come a point where the “DO NOT USE PAST 2 WEEKS…. unless prescribed by your doctor” needs to be abolished. Just because the doctor says to do it, doesn’t mean the warning on the label goes away. I, personally, did two sets of tapering oral steroids. My skin gradual got better on the pills, but as soon as it tapered off, I went right back into this mess. How unfair this that? Even when there is proof, a doctor is going to deny it? It makes absolutely no sense. So many people who don’t believe in this say they think its outrageous that people are doing this and should go back to the drugs if they are suicidal. When will the thinking start turning towards saving people from this by actually prescribing these drugs correctly/actually finding out the cause of the patient’s problem instead of continuing to endanger patients and call them crazy for ceasing to use a drug that is literally destroying them from the inside out? I saved the best for last. This hits home for so many sufferers. This is not about bashing steroids. This is about showcasing how overprescribing these drugs are ruining people’s lives in every way imaginable. What is the first thing you will do when healed? Reapply for my job as I loved my short time working on cruise ships! What type did you use: Used Betnovate on and off since October 2015 for patches of eczema behind the knees and inside of elbows. What is the hardest thing to deal with during this condition? The flares with oozing, (they scare me), the itch is worst part now , also having to give up dancing and pulling out of a show in February. I miss my friends, school and gymnastics. What is the first thing you will do when healed? Playing my instruments and dance lessons. What doesn’t kill you makes you stronger! 1.When did you start using topical steroids? And why? Kline started at 4 months old for baby eczema. 2. What was the name of the topical steroid? His eczema kept spreading and getting worse What kinds? I think dermasmooth was the highest potency we used. He looked just like everyone else…red sleeve and all. We saw Dr. Rapaport at 6 weeks off topical steroids to confirm it. Yes, Dr. Rapaport and some homeopathic and chiropractor. 10. What has been the hardest part of this condition? The length of the withdrawal and watching your baby suffer and not be able to help them or speed it up. Started February 21, 2012, 4.5 years ago. Kline is still in withdrawal but living his life and much, much better…the itch and skin is managable but not perfect. 12. What do you use as comfort measures during this? Popsicles, ice packs, lavender oil, EPROMs salt, Shea butter with essential oils, gauze and tape. I had to take a night job because Kline couldn’t go to school. Yes, I think we all have PTSD and depression from this terrible life changing ordeal. 15. If there is one thing you could say to another sufferer, what would it be? Take each moment by moment ..don’t get your hopes up on a time frame for healing, expect more flares to come. And ask for help! You are beautiful and strong and can do this!!! Thank you so much, Loren, for taking the time for this interview! What is your favorite product for comfort? First two months “Simply Natural Oils” chickweed ointment. Month 3-4 Natural Shae butter. Month four moisture withdrawal. Epsom salt baths and wet wraps soaked in coconut oil for first four months. What is the first thing you will do when healed? We went camping and swimming in the beach last weekend despite mild anniversary flare. IT WAS AMAZING!!! Living the dream already!!! Career: I’m currently unemployed due to TSW. I was a track rider/stablehand in a horse racing stable. What type did you use: I used various different types of TS, primarily Betamethesone, Diprosone and Prednisolone. What is your favorite product for comfort? I find Dermeze Ointment has provided me some relief during TSW. Also cool baths. What is the hardest thing to deal with during this condition? There are so many negative sides to TSW, it’s difficult to pick just one. For me it would be the utter destruction of my career and sense of living. Not being able to leave the house due to such severe skin for so long leaves its mark. What is the first thing you will do when healed? The first thing I want to do when my skin is better is take up horse riding again! It’s painful not being able to spend any time doing the things I love. Follow PREVENTABLE: PROTECTING OUR LARGEST ORGAN and stay updated with new information regarding our fight to prevent Red Skin Syndrome and bring reform to topical steroid use. Preventable: Protecting Our Largest Organ is fiscally sponsored by Creative Visions Foundation (CVF). CVF is a publicly supported 501c3, which supports Creative Activists who use the power of media and the arts to affect positive change in the world. 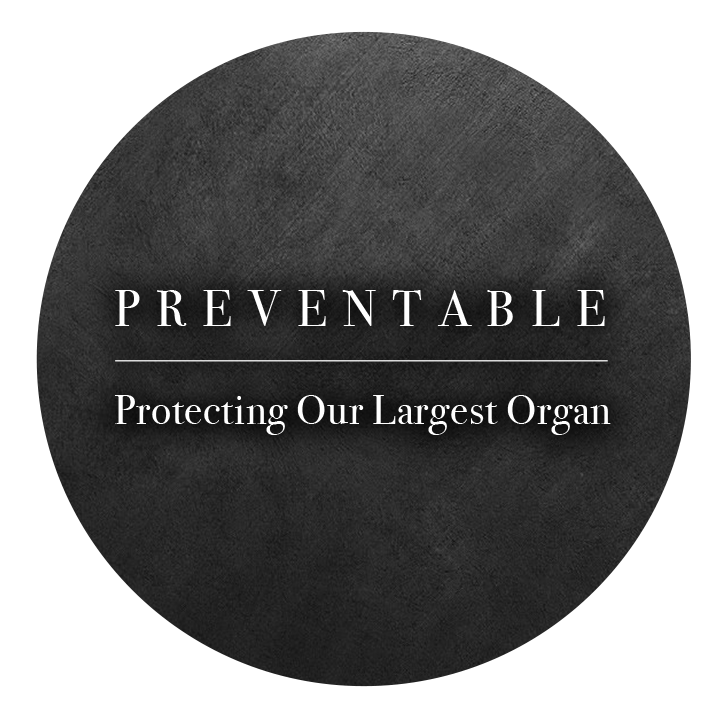 Preventable: Protecting Our Largest Organ Blog at WordPress.com.